The 24-year old Robert Gsellman looks to regain his 2016 form and a spot in the New York Mets rotation after a disappointing 2017 campaign. Gsellman was drafted by the Mets in the 13th round of the 2011 MLB Draft from Westchester HS in Los Angeles, CA. In 2011, Gsellman got his feet wet pitching 13 innings for the Gulf Coast Mets and gave up six runs in those 13 innings. He remained there in the 2012 season where he split time in the bullpen and the rotation where he had a 3.92 ERA and quickly showed his good control. 2013 had Gsellman spend time at all three levels of Single-A as a starter where he had a sparkling 2.58 ERA and earned an All-Star selection with the Brooklyn Cyclones. In 2014, he spent the full season with the Savannah Sand Gnats and continued to impress with a 10-6 record and a 2.55 ERA in 116 innings. This earned him the #16 spot on the Mets top prospects list. 2015 was more of the same for Gsellman as he was showing how consistent he could be for the Mets. He split time with the St. Lucie and Binghamton Mets where he went 10-7 and had a 2.89 ERA, which earned him All-Star selections from MILB.com and the Florida State League. Gsellman established himself as the #9 Mets prospect as well. 2016 was a big year for Gsellman but he was not too hot out of the gate. He went 4-9 with a 3.99 ERA between stints with Binghamton and the Las Vegas 51s, but when the injury filled Mets pitching staff needed an arm Gsellman got the call-up in late August. 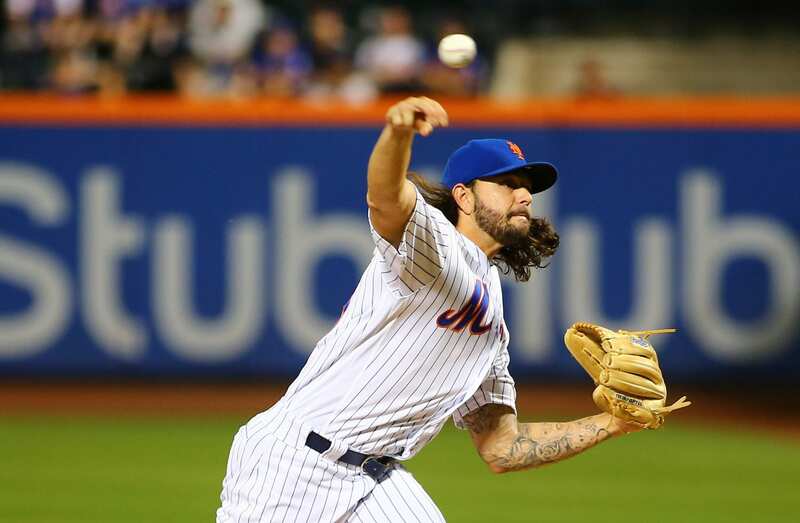 Gsellman made his MLB debut against the St. Louis Cardinals after Jon Niese exited with an injury after facing only four batters and allowing three runs in the bottom of the first. Gsellman stepped up to throw 3.2 shutout innings to allow the Mets to win a game that sparked their Wild Card chase in 2016. Gsellman finished 2016 strong, going 4-2 with a 2.42 ERA and was one of the big reasons the Mets clinched the second Wild Card spot. He came into 2017 with high expectations as the Mets fifth starter and was unable to pitch anywhere near what he was expected. He went 8-7 with a 5.19 ERA and missed a significant amount of time after pulling his hamstring trying to beat out a hit. Gsellman also said “I don’t care” when GM Sandy Alderson said he needed to “pitch better” which led to Aaron Judge hitting a tape measure shot off of him the same night. Gsellman has allowed three runs in five innings this spring and had one good start and a below average start the last time out against the Houston Astros. Gsellman will likely head up north with the Mets at the end of March and definitely has a chance to be in the Mets rotation. With Syndergaard, Vargas and deGrom locks, if healthy, the other cast of starters the Mets have will either be relievers get one of those last three spots. But, Gsellman is likely heading towards a bullpen role with the Mets in 2018. New York Giants: How Much Should Odell Beckham Jr. Actually Be Paid? If The Giants’ Offense Looked Like This In 2018, Would You Be Happy?